Silvercrest Garner had a studio, which is very nice, and a nice outdoor area. The location was great and presented itself well when I walked in. It looked like a newer facility, very bright and sunny. I met with one person who was very nice and willing to accommodate. It was significantly pricier for assisted living but I liked it. Silvercrest Garner was at the top for us and was the best. It was not a brand-new building, but the maintenance and upkeep refreshed constantly. Everything was in great condition, and they are even doing additional maintenance for us on anything that we requested to have done. We were very impressed with the food and our mother enjoyed it, as well. They provided us with an incentive when we inquired as to a possible discount. It is a great value for what is included, so we are quite happy with it. Everybody on the staff as outstanding, and the residents were engaged, happy, friendly, and outgoing. We are served excellent food. Housekeeping is excellent. We have 24 hour security people who take care of emergency situations. Our Activity Director provides places to go and things to do. The indoor garage has a temp of 62-64 degrees year round. I loved living here for 6 1/2 years. The Garner do an excellent job! I had some dear friends living at Silvercrest Garner and was always impressed with all of the staff. They are all so kind and friendly. Especially love the ambassadors. My father-in-law will be moving in soon. Silvercrest has been a God send! We spent an entire day looking at places. As soon as we walked in the door we knew this was the place for mom. The people were so friendly. It wasn't closed in and depressing like other places. It felt warm and wasn't confining. Thank you! Silvercrest is very open, but the accommodations wasn’t large enough. There’s a fireplace, and a waitress in the cafeteria like in a restaurant. They have hairdresser that my mom is very happy with. She had one-bedroom assisted-living apartment with a kitchenette, and a stove. It also has a microwave, and refrigerator. They had bingo, happy hour, and outings. She really likes it there, but I’m still trying to get accustomed to the girls work; and their assistance. I still have a few things to iron out with them. Excellent! I love the exercise room, coffee, movies and programs. If I didn’t want to stay at home and read or watch TV there is always a program going on. I like the food and can always order something I enjoy. I love the ambassadors, they are right there to help me when needed. the employees are great! I have been absolutely satisfied. Thank you so much for your wonderful review. It warms our heart to hear how much you are loving the way you live. The staff and all employees are great! They also have great smiles and willing to help in way they can. As a new resident I find that the other residents feel at home also. Thank you for your review. We are so happy to hear that you are enjoying yourself at Silvercrest Garner! Mom is content with all the services for 2 1/2 years now. All kitchen help is great. All the people are pleasant and all areas doing a good job. Of course, with everything always room to make it better. Thank you for your wonderful review! We are happy to hear that your mother is enjoying herself. Please know that you can come to us with any suggestions and we will gladly work to make those changes. I feel the services are excellent. Love the staff. Very Pleased. Thank you for your great review! We are so happy to hear that you are loving the way you live. My parents stated “Everything and everyone is excellent here.” The staff definitely goes beyond what is expected. Everyone shows love and respect. Their communication with the residents’ family is superb. We love all the one to one attention. Thank you for your wonderful review. We are so happy to hear that your parents are loving the way they live! The girls that take care of me never seem to get rattled. They are all so kind and they smile no matter the situation. I have some health problems and they come and help me with a smile. They do a beautiful job. I can't believe they could be so kind. Thank you so much for your wonderful review and your kind words. It warms our heart to hear how happy you are. The rooms/apartments at Silvercrest Garner Farms were very nice. The staff was nice, but I don't think they were quite as accommodating. They did have a theater on the property where you go and watch movies, and it was nice. The rooms were big and spacious too. Thank you for your review. I am happy to hear that you found the community a nice place. We really strive to ensure everyone's visit is a wonderful experience. I hope that you will come back and see us again soon! Silvercrest Garner Farms was a very nice facility. Everybody was very helpful and professional. The rooms were very nice. They have arranged trips and outings, they have transportation services, and they have quite a few social events. The residents all seemed very happy. Thank you for your kind words. We really love what we do here at Garner Farms and we are so happy that showed through during your visit. We hope to see you again soon. The first facility that I saw was Garner Farms at Silver Crest. They answered my questions, and they were very open about the expected costs. It was very satisfactory and it was a very good option. I was offered to eat the food, but I chose not to. Thanks for visiting Sue. I am glad you see Silvercrest Garner Active Retirement Community as a good option for your loved one, with us offering Independent Living, Assisted Living as well as Memory Care we feel we can meet the needs of seniors quite well. Our food is great, if you happen to visit again have lunch on us! Thanks again for visiting Garner! I liked everything at Silvercrest Garner. The facility was clean and well maintained, and the staff were fine. I moved to Silvercrest Garner in May of 2013 after a stroke. The fascilities are very nice and staff are friendly and always there to help residents Transportation is available for residents for medical appointments and other needs. The garage is beneath the building. Apartments are large.enough to not to feel cramped and windows are large. The dining experience is very nice with tables for four or more Guests are welcome My experience is like being part of a large family..I would recommend Silvercrest Garner without reservation. Thank you so much for your wonderful review! We are so happy to hear how much you have enjoyed the past two years here at Silvercrest Garner. Your kind words mean so much to us. Mom is currently living at Silvercrest, for a couple of weeks now, and she was very pleasantly surprised with their apartments. There are several different styles and sizes. There was one that she really liked, and it was available, and that is the reason why she chose this facility. The facility was very nice and clean. The staff was very friendly and accommodating. So far, they have been extremely helpful, and every time she asks questions or requires anything, they have been very prompt in responding or giving her what she needs. Mom eats dinner there, and she enjoys the food. They have quite a few activities available, but Mom has not participated in any of them yet. At Silvercrest Garner Active Retirement Community, you will receive the privacy, care, and attention you need for an enriched and fulfilling life. Conveniently located at West 53rd and North Division Streets you will have easy access to shopping, dining, and entertainment. We don't just offer senior apartments, we are also a full service Assisted Living with an additional Alzheimer's and Dementia Community. We provide excellent care and offer amazing recreational activities that will provide you with the perfect amount of enjoyment you need during your retirement. Our care staff will offer you the type of one on one attention that is expected from one of the top Senior Living Communities in the Quad Cities area. Silvercrest Garner Independent Living Community allows you a full range of customized services. Our spacious apartments are equipped with full kitchens, individual controls for heat and air, hook ups for television, phone and internet, smoke and fire detectors and washer and dryers. Our Independent Living residents can enjoy three chef prepared meals a day, underground parking, and an active social life with an array of activities and outings throughout the day. Silvercrest Garner ensures that residents enjoy the benefits of living in a community while still enjoying their privacy, independence and maintaining their dignity. We are proud to be one of the most well regarded retirement communities in the Quad Cities area, offering the perfect balance of Independent Living, Assisted Living, and Alzheimer's/Dementia Care. We recognize that not all of our residents will have the same needs. That is why we also offer Assisted Living and Alzheimer's/Dementia Care. Your loved one will be attended to with the utmost care and concern by an experienced and professional staff. Our goal is to provide our residents with the opportunity to enjoy life with privacy and dignity while receiving the care and support they need to Love the Way They Live. At Silvercrest Garner we encourage independence with the safety, security and comfort of our residents as our primary focus. 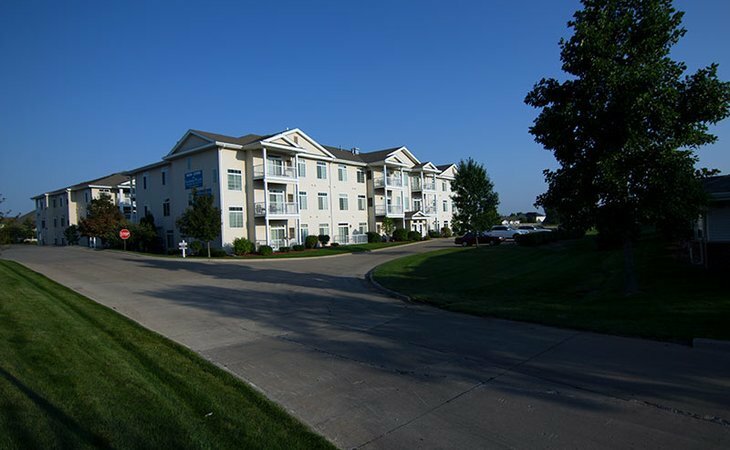 If you are looking for Senior Living apartments, Assisted Living or Memory Care in Davenport, please browse our website to find additional information about our Independent Living, Assisted Living and Alzheimer's and Dementia Care services. Conveniently located at West 53rd and North Division Streets you will have easy access to shopping, dining, and entertainment. We don’t just offer Independent Living Apartments, we are also a full service Assisted Living with an additional Alzheimer’s and Dementia Community. In our community you will find many unique features from an Ice cream parlor, bar & lounge, heated underground parking, chapel, and theater in our Independent Living to an elegant library, whirlpool spa room, and gorgeous courtyard in our Assisted Living. What should caregivers and potential residents know about Silvercrest Garner?